I apologize for the lack of WMU preview, I was in Maine eating lobster. Actually I'm not sorry about that. Hopefully last weekend's hamblasting of a bad Western Michigan team brought some of you one step closer off the ledge. And if it didn't, well, prepare for another hamblasting. Michigan comes off a 49-3 victory over the S&P+ #117 ranked team and prepares for the #116 ranked team in the Mustangs. This will probably be a similar performance but with a later start time that makes you miss the opening kickoff of the evening games on your drive home. There's not a whole lot of information to be gained in games like these (unless things go terribly). However, Michigan struggled last year against Air Force and Cincinnati and those teams ended up finishing #100 and #102 respectively in S&P+. We've gone from ARGHH to meh and we should be happy about this. But anyways, on to SMU. SMU lost to North Texas 46-23, but all of SMU's 23 points came in the 4th quarter and 14 of those points came in the last two minutes on 59 and 71 yard "pass plays". The 2nd wasn't the result of an onside kick, North Texas returned the kickoff for a touchdown. SMU's QB, Ben Hicks (#8), is a 6'2” 220 lbs <50% completion percentage type guy not named Wimbush and with slower legs. His 12-24, 252 yards, 2 TDs, 1 int statline against North Texas is made much less impressive when you consider that both TDs* and 130 of those yards were in the last 1:41. And with -24 yards on 13 carries, don't expect Hicks to be a huge running threat. That job is for Braeden West (#6), who in two games has 104 yards on 19 carries (5.5 avg). Ermm, 51 of those yards came on one play. Remove that and he is 53 yards on 18 carries (2.9 avg). Woof. *One was a dump-off to a receiver in the flat and the other was one of those little flicks to the running back on a sweep, so...They were basically running plays. In garbage time. Wide receiver James Proche (#3) has some legs and was able to make that 59 yard TD pass from the flat happen though. Aside from this play, he has 68 yards on 7 receptions (9.7 YPC). I'm trying hard to find nice things to say about SMU's offense but there's only so much that can be said about the #97 ranked offense in the country. They will face the #3 ranked defense and use their playmakers to kick another sad field goal in the 4th quarter. Against WMU, Patterson did the thing where you throw the football to a wide receiver type guy and then they took the football to the endzone. You may have heard that this hasn't happened in a while. Expect it to happen more. 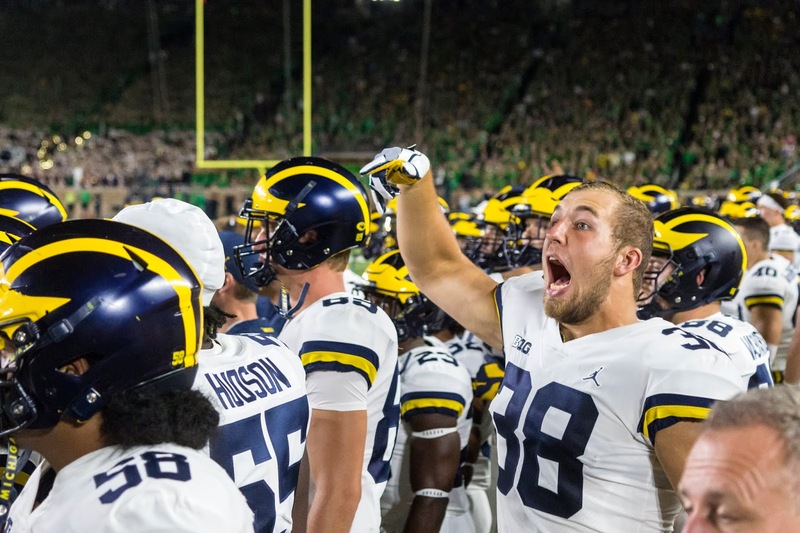 Michigan's offensive line looks serviceable against bad defenses, so yay. Let's take a look at SMU's recent pass defense performance against North Texas and see if there are OH MY GOODNESS. FWIW SMU held North Texas to 87 rushing yards on 38 carries (sacks removed, 2.3 avg), and North Texas runs the air raid. But that's some high efficiency. 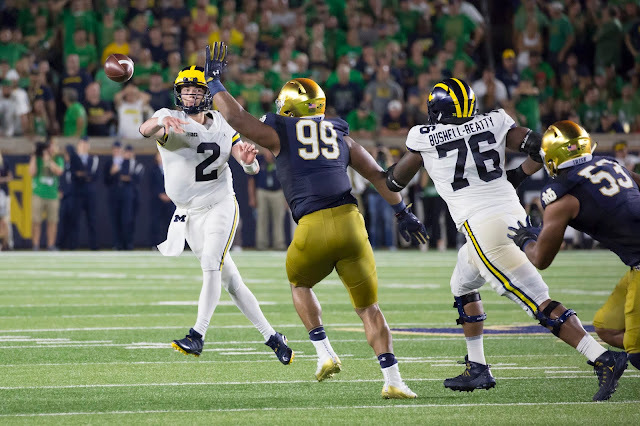 Michigan's offensive line needs experience and practice so SMU coming in before Big Ten play should be good for them. In two games the SMU defensive line has two sacks (both against North Texas). Run the score up and give the youngsters on the line some experience. They were able to hold TCU's Shawn Robinson to 16/29 (55%) and 154 yards, 1 TD 1 Int, but gave up 239 yards rushing on 41 carries (5.8 avg). In short SMU has the #109 ranked S&P+ defense (an improvement on WMU's #120 defense). 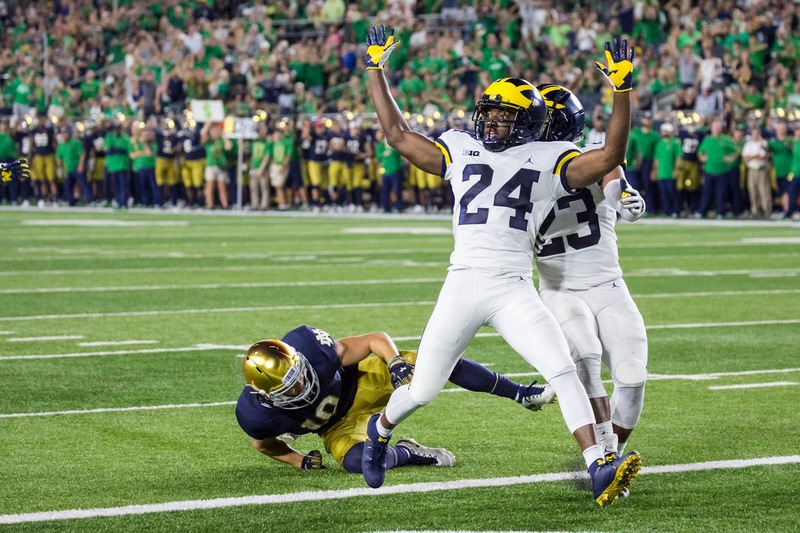 The worst part will probably be people saying that the last time Michigan's wide receiver scored passing touchdowns in back to back games was- ok we're done here. 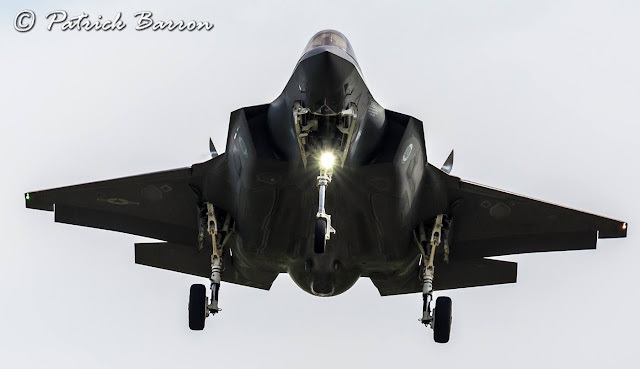 -F-35s are performing the flyover. -Weather looks beautiful, high 70s and sun. -Offensive line smashes a bad defense and we feel good about it. -Joe Milton uses one of his four redshirt freebie games to throw a 90 yard touchdown pass where 85 of those yards are in the air. -The F-35 flyover sparks a stadium-wide argument on defense spending and technological compromises. -SMU hits a sad field goal down 77 -0 as time expires and enrages the only fanbase that would get mad about this scenario.